4 IN 1 FUNCTION】 - Support up to 24-bit / 48 kHz audio output. In addition, it not only supports charging and listening to music, but also supports remote controls and microphones. Audio and charging are synchronized. SUPPORT LISTEN MUSIC + CHARGING + PHONE CALL + MICROPHONE AND REMOTE ON LIGHTNING HEADPHONES AT THE SAME TIME. 【HIGH QUALITY】 - 100% copper wire core to provide you with high speed and stable signal transmission and lossless digital sound quality. High quality fexible plastic shell is more wear-resisting and corrosion resistance, enhancing the anti-interference ability. Allowing you to enjoy clear and fidelity sound quality and rapid filling experience. 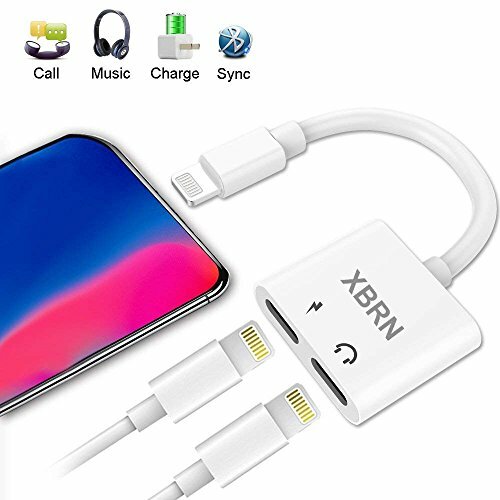 【EXCELLENT COMATIBILITY】 - Designed for iPhone X, iPhone 8/8 Plus, 7/7 Plus, and any lightning device. Support upgrade IOS 11 upgraded chip-set, making the adapter compatible with any Lightning device that runs iOS 10.3 or later. 【SIMPLE DESIGN & PORTABLE】 - Made by Original Chip And High Quality Material, Luscious, Textured for Sense and Durable for Use. Slim and protable design is easy for you to carry around. You can put it into bakpack and handbag when you go out, and it doesn\'t require additional audio software, just plug your headphone into the jack and enjoy your music. 【12 MONTH QUALITY GUARANTEE】 - Your satisfaction is very important for us. We provide a 12-Month Worry-free warranty. If you have any questions ,welcome to cantact us, we will response within 24 hours.